Oil prices have been tumbling in recent weeks. The price of brent crude fell below $US80 per barrel today for the first time in since September 2010. That’s down from around $US115 earlier this summer. A research note from Societe Generale’s Michala Marcussen takes a look at the possible effects of a drop in oil prices on the world economy. She plugged a sustained $US20/barrel drop in oil prices into Britain’s National Institute of Economic and Social Research’s NiGEM software, a sophisticated global macroeconomic model, and saw what would happen to global GDP in the following years. For oil exporting countries, there would be an immediate negative shock to GDP growth as a result of the oil price drop. Meanwhile, there might be a strong bump in GDP growth for oil-importing countries, most notably the US, Canada, and some countries in Asia. The researchers also include a number of caveats, given that economic simulations and predictions of this nature are always filled with assumptions and uncertainties. Societe Generale’s results are summarized in the chart. The blue part of the bars show the effect of the price drop after one year, brown after two years, and grey after three years. 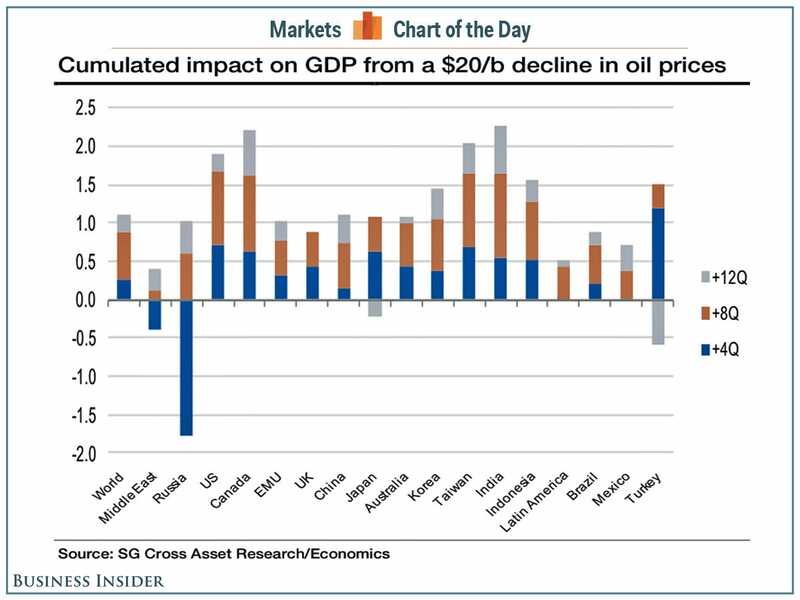 “As seen from the chart, a $US20/b decline in the oil price adds 0.26pp to World GDP after the first year of the shock,” Marcussen wrote. Russia stands out as the big loser in the first year.